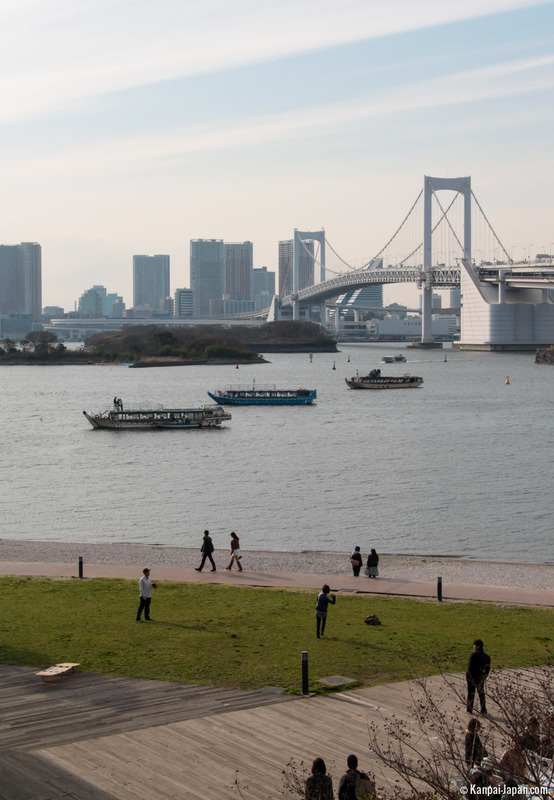 The nickname given to the famous Odaiba Polder, “Entertainment Island” is definitely not a misnomer: in addition to its many shopping malls and attractions, it also harbors the only beach to be found in the Tokyo area. For the sake of accuracy, let us specify that it is actually part of the kaihin kôhen (literally “seaside park”), a vast expense of land located near the dike and below the piers. Although the beach is strewn with a few scattered rocks, the surrounding landscape is mainly concrete except for the greenery after which the park is named. The Decks Shopping Center, known a “Tokyo-Beach”, is closest to the beach. 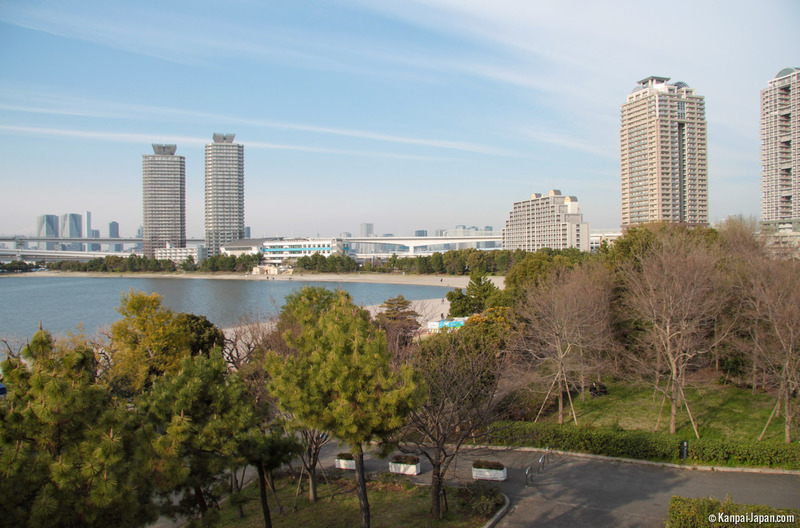 The 800-meter long Odaiba Beach is obviously artificial and extremely urban. Since bathing and fishing are forbidden (water quality does not reach the levels required for bathing, according to the Japanese Ministry of Environment), the area is mostly dedicated to walking and relaxing. The Japanese might sometimes dip a toe in the water when the weather is fine, a favorite pass time with children who can also play football or Frisbee. Toilets and showers are of course available. Various events are organized on the beach, in particular sports contests on the sand or in the water, for example volleyball games, marathons or sailing contests. In July, a matsuri (festival) is hosted on the beach; lanterns are lit all over the place to create lovely reflections and a delightful atmosphere. It is extremely pleasant to walk along the beach below the shopping malls and enjoy the superb view of the famous Rainbow Bridge and the skyline of the city center in the background, including Tokyo Tower. 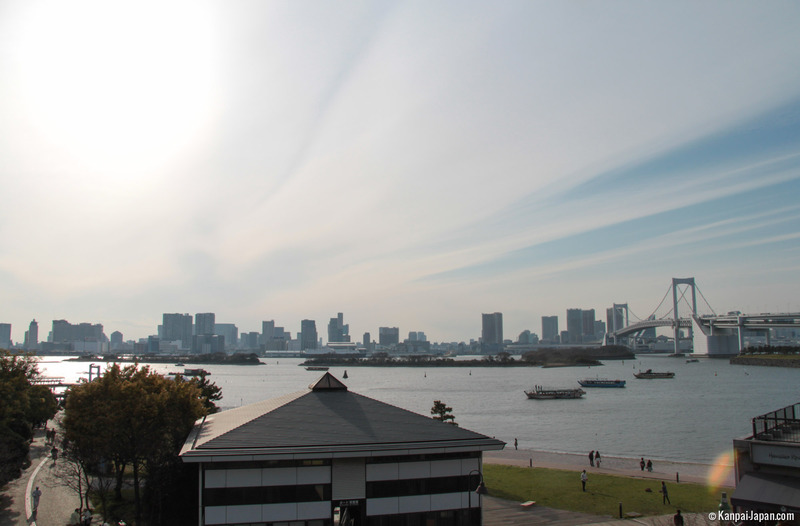 Odaiba Beach is the ideal place for watching the sunset or even enjoying the spectacle offered by the reflection of the nighttime lights of the shopping malls above.